Parents are deeply concerned about an After School Satan Club that targets children as young as five scheduled to open at Point Defiance Elementary School in Tacoma, Washington, on Wednesday, December 14. Parents and concerned citizens will be gathering for a prayerful and peaceful protest against the Satan Club in front of Point Defiance Elementary School on December 14, from noon to 1:00 PM. America’s first After School Satan Club sponsored by the Satanic Temple was opened on November 16 at the Sacramento Elementary School in Portland, Oregon, despite numerous complaints, protests and rosary rallies organized by parents, teachers and local Catholics. 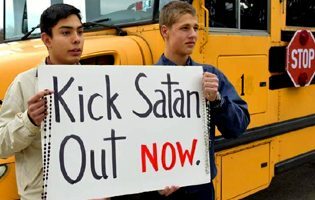 Keep Satan Out of Our Schools and Away From Our Children – Sign Here! America Needs Fatima invites everyone who loves children and abhors Satan to join a peaceful prayer rally in front of Point Defiance Elementary School on Wednesday, December 14, at 12:00 noon. For more information, call America Needs Fatima at 888-317-5571. This entry was posted in Fighting the Culture War and tagged America, campaign, children, Father, God, moral, Mother, Order, parent, Petition, pray, protest, rally, Satan, School, society by TFP.org. Bookmark the permalink.